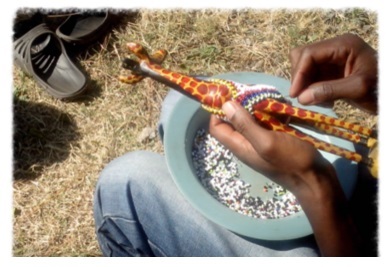 Inspirational Beading: How did the Thembalethu Beaders project begin? 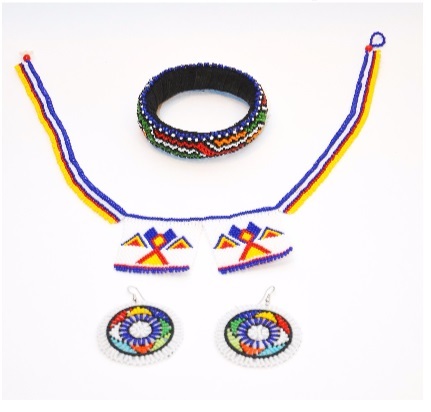 Adam: Thembalethu Beaders was born in the pursuit of a meaningful contribution towards the rising levels of unemployment in the rural communities. We further recognise that training and education would serve no meaningful purpose unless it is linked to job creation – and to ensure the success of any such initiative, it is imperative that all of this becomes self sustainable. Inspirational Beading: What are the most popular materials or colors for the beaders to use? 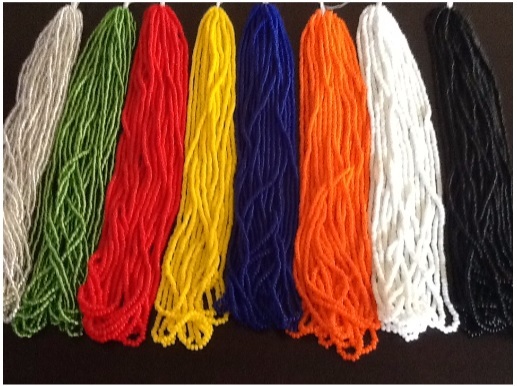 Adam: Most popular materials are loose glass beads, and the popular colors are [green, red, yellow, blue, orange, white, and black]. Inspirational Beading: How has the project affected the community so far? What’s on the horizon? Adam: The concept of Thembalethu is based on a holistic approach and a new philosophy towards people, training, development, empowerment and business. Thembalethu believes that an innovative and creative approach to the numerous challenges we are facing in South Africa, will unleash great opportunities for those rural women with the ability to rid themselves of the limiting beliefs of the past. The result is an income generating community of rural women. These ladies, who generally meet in groups for their beading activities, are able to talk to each other and in this way, are developing solutions around the various issues on HIV and AIDS which impact on them. Several of these include AIDS orphans resulting in children raising children [and] grandmothers left to feed and care for their grandchildren. You can learn more about the project, and see many more designs at ThembalethuBeaders.org. My tentative steps back into my normal beading routine have begun, and I have actually had some time to sit down with beads over the past couple of days. I decided it was time to just pick a project and go with it, then took some time to decide what I really, really wanted to do. For a while, I plan to just make things that I want to, and avoid anything that feels obligatory (though that doesn’t rule out a tutorial or two!). I finally decided to do something with stripes, and to just go ahead and use some of my favorite colors without worrying about quantities. This new project is all about fun. So far I’ve got the beginnings of a nice herringbone rope. I haven’t yet decided if I’m going to add additional colors or just stick with the olive green. To help keep things interesting, I’m also chipping away at unfinished projects, rather than dedicating all of my time to a single piece. Changing things up a bit may take away from the progression of each project, but I still feel a sense of accomplishment with each new stitch. Although I can’t say that I’m dead excited to sit down, it does feel familiar to be beading again, and there is comfort to be had in that. Part of my newfound motivation is thanks to finally getting another creative project out of my system. My bead helper and I did some paintings this week that turned out pretty great. We’re planning to do more as soon as we get the chance, and to experiment with techniques and themes. The joy of making something is definitely helping to bring back my need to bead. Today I want to introduce you to an amazingly talented beader. 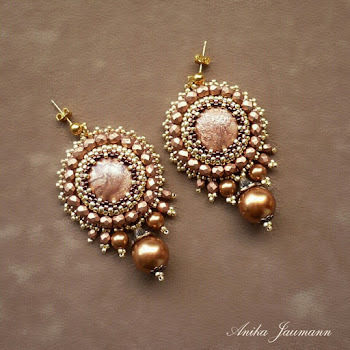 Anika Jaumann’s elegant beadwork designs are a delight to behold! Inspirational Beading: When did you first get started with beading? Anika: As a kid, I used to string bracelets and necklaces out of wooden beads and wore them in kindergarten – I put them secretly on after my mom was gone, because she didn’t want me to do so. When I was eleven, I discovered glass seed beads and strung some bracelets, but this didn’t turn into a regular activity until in 2010 when I decided (out of the blue, actually), I really needed a pair of strawberry earrings. But the metallic ones you could buy on the internet didn’t match the vision I had in mind until I stumbled across a picture of beaded ones. So I went into the next craft store, bought some seed beads and wire and was immediately sucked into my new passion and, I’ll admit it, addiction. After half a year of happily “fumbling around” and diving through colors, shapes and textures, I sat down and taught myself off-loom weaving techniques and later, bead embroidery. All of this very soon lead to my own designs. It all felt like a very natural process, actually. I was and am still astonished at what one is able to do with only a few beads, some thread, a needle, and the gift of imagination. Inspirational Beading: What is your favorite thing about jewelry making? Anika: There is a lot of pressure on women and their looks these days, and sometimes I feel the fashion industry doesn’t really help us to come at peace with our body and individuality, but rather forces things on us that don’t fit all. I’m not able to make clothes by myself, but still like to look pretty and feel good when looking in the mirror, but my choice of clothing is limited by the current trends I can’t influence. By making my own jewelry, I can still make a fashion statement, but I’ve got much more freedom to decide what I want to say through my jewelry and how people judge me by my looks. Also, I’ve always loved colors, the different shades, the emotions they convey, how shades change when combined. Beads and other materials I use for jewelry making provide me with the exact thing I’ve been subconsciously looking for when I decorated my apartment, made little colorful books out of self-written poems, or purposely combined unflattering shades within my clothes: A medium that has no limitations in the aspect of color, but rather opened my eyes to what can be done with thousands of different shades and how they’re altered by astonishing bead finishes. Inspirational Beading: Do you remember your first piece? Where is it today? Anika: This was actually the pair of strawberry earrings I mentioned above. 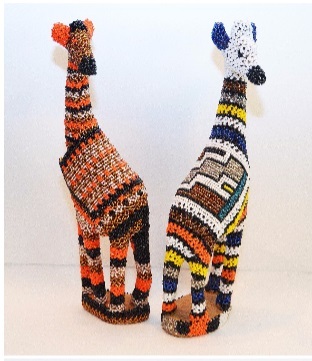 They were made with seed beads and wire, so naturally after a while they fell apart. I replicated them multiple times because I liked them so much, and every pair got better than the one before that. I think the fourth version was finally a 3D-piece. Throughout the first year, I made a lot of “practice pieces“, some with really nice color palettes, some with – well, not so nice. As my skills and knowledge about design and color improved, the pieces got more elaborate, and one by one I could identify the poor decisions I sometimes made in my first pieces and understood why one bracelet or the other just hadn’t worked out. As a part of growing and looking forward, I’ve now torn so many pieces apart I can’t even count them anymore. Sometimes this process hurts, but it also makes me very humble and thoughtful, and I think this helps me to become a better designer. Inspirational Beading: Where do you look for your favorite inspiration? Anika: There are three sources of inspiration. First is my stash. I don’t think it’s very huge, but it’s very well sorted by temperature of color, then saturation. This helps me to create the warm, sometimes autumnly palettes I love to work with, while also having some cool shades as accents to throw in. The diversity in shapes and sizes of beads serve as inspiration to me as well, so they aren’t sorted at all. 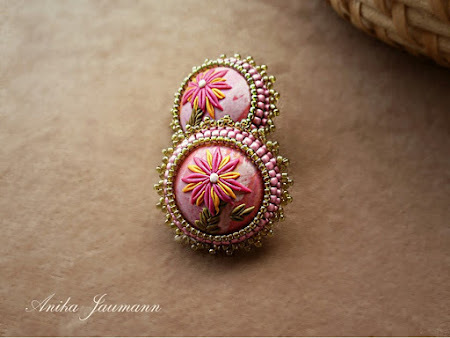 Second source is the work of other bead designers. Jamie Cloud Eakin’s work is stunning, as well Irina Chikineva’s. 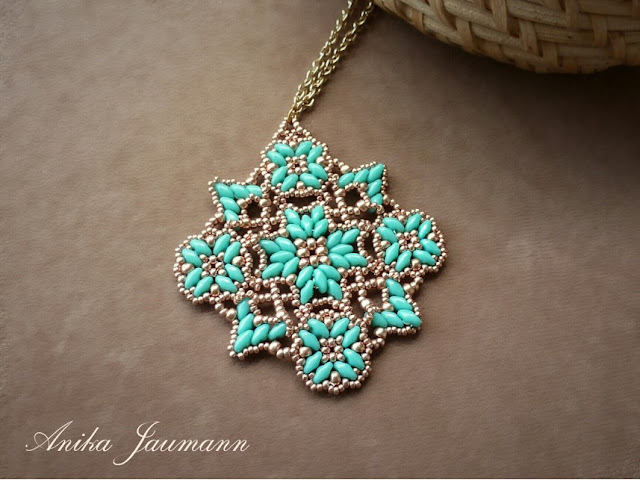 I’ve been following “Inspirational Beading“ since my very first beginnings, and I think Mortira really serves her mission of inspiring other beaders with her wonderful pictures and well-written posts. I don’t look at pieces by other designers and try to duplicate them, but rather ask myself: What is it in this piece that grabs my attention? What kind of technique did the designer use, how did she/he use color, materials, finishes? What makes this piece a "Wow"-piece? Third comes my mind. I’m always trying to get input through books about beading, color and design, pictures by other beaders, my stash, scrolling through online bead stores or visiting actual stores – with all of that combined, ideas come naturally. I don’t try to force them but let my subconsciousness do the work for me. In this way, I feel more connected to myself and can explore my own style in a more honest way rather than trying too hard to reach a certain “level“ or message that I admire in others, but is not my own. 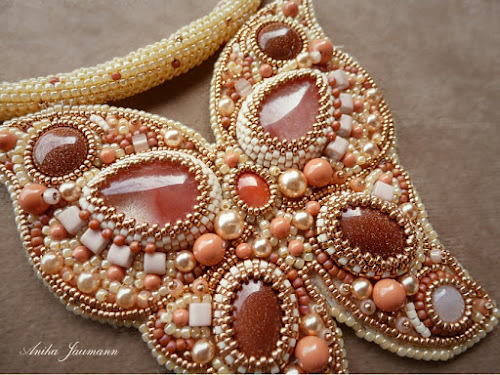 Inspirational Beading: What is your favorite kind of design to make? 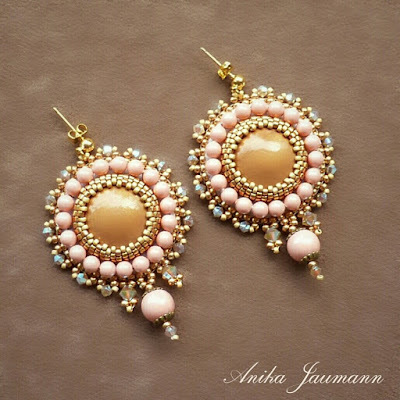 Anika: Romantic feminity, with many tiny beads, rich textures, butterflies and flowers, definitely speaks a lot to me. On the other hand, I don’t like to work with the “typical” rose, cream, baby blue or lavender palettes but rather apricots, warm coral rose, honey yellows, gold, terracotta, light copper, olive and so on, so my combinations sometimes may seem a little unusual in regards of style versus color choice. And it’s exactly this contrast that feels right to me. Embellishment is my favorite part of the process. In this step, I get the opportunity to enhance the message the basic piece is already telling. I love the care it takes to balance this emphasizing aspect versus the risk of overpowering the rest of the piece. Concerning the kind of jewelry, I somehow make a lot of earrings, simply because I love wearing them. But the design choices are limited here, because of size, shape, and weight, so I’m currently working on necklaces as well. Inspiraitonal Beading: What’s the most interesting or unique thing about your design process? Anika: The most dominant aspect of my design process is the constant change. I always try to control certain aspects of it, as I’ve got the feeling the resulting designs will be better this way, but this just works for a short period of time until everything organizes itself in a chaotic, somehow organic way. My latest method to work with went as follows: I first pick a color palette consisting of different shades, partly with help of my knowledge of color theory, partly listening to the feeling the colors awake in me. I then decide upon the technique and design. With bead embroidery, I usually start with the center pieces, with a vague vision in mind that develops throughout the process. Sometimes I take notes, sometimes not. I’m really awful at drawing, so I don’t really use sketches a lot. Inspirational Beading: Do you have a favorite color to work with? Anika: I’ve always been drawn to warm colors, mostly the ones that are less saturated, with no preference for light or dark. My favorite neutrals to work with are terracotta, light copper, all shades of gold, bronze, sometimes beige, sometimes amber, sometimes a cool sand. With colors, I prefer shades of honey, vanilla, warm, muted orange, hyacinth, coral pinks and reds, turquoise, blue greens, light olive, blueish violets, sometimes muted rose tones, sometimes cyan, sometimes flashing yellow. I love working with opaque and metallic finishes, accentuated by matte, aurora borealis, ceylon finishes or big stunning transparent glass beads. I used to throw many colors in one palette, but lately discovered the great effect that many neutrals create when combined with just one or two colors. I always strive for slight contrast on the light-dark dimension, but still watch out for wearability. Inspirational Beading: Do you have any favorite materials or beads? 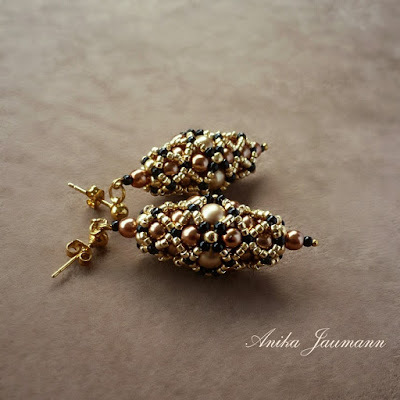 Anika: Nearly every type of bead or material can speak to me if it comes in my favorite colors or shapes - I prefer round shapes or rounded edges rather than sharp, geometric elements. As a vegan I try to avoid beads made out of bones, teeth or freshwater pearls, shells and corals. Since last year, I’ve started making my own cabochons and beads out of polymer clay, and am currently improving my skills on caning and appliqué techniques. Self-made cabochons give me the opportunity to work with exactly the shade that I want – with color being so important to me, I consider this a huge advantage. I think not just the expensive materials like crystals, semi-precious stones or Swarovski elements are nice to work with, but also “cheap“ ones like polymers or acrylic if they are well made. Also, I lately stumbled across Greek artist Igor Spirin and his wonderful hand-painted wooden jewelry and boxes. I asked him for cabochons, and the ones he made for me are so beautiful I haven’t used them yet because they make me so humble every time I look at them! Inspirational Beading: What is the most exciting design in your stash right now? What makes it special? 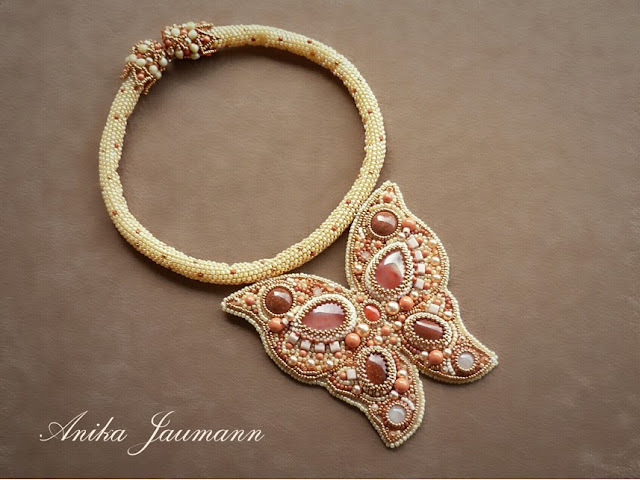 Anika: My latest design is a bead embroidered butterfly necklace, and it is really special to me. When I started bead embroidery two years ago, I always had a butterfly in mind, but didn’t think I would be able to figure out a pattern with good contrast, movement, focal points and rhythm. When I started this butterfly, I was really scared and had to step far out of my comfort zone. But, just as my other designs, it just evolved under my hands in a way I could have never imagined in my mind before. I was and still am astonished by the result and am already kicking in the start hole for many more of them. Inspirational Beading: Do you have plans for any new designs in the coming year? Anika: Definitely! I always have visions about my upcoming work. As I mentioned above, there will be more butterflies and probably flowers, big embroidery necklaces, and – this excites me the most – embroidered purses. I myself can’t sew, but I always wanted to embellish a purse with an embroidered piece. I’ve been looking for a purse forever, but they were either too cheap or too expensive or not vegan. But a friend of mine developed her sewing skills and is in the process of making a clutch for me to work with. I am super excited for that! Thus, I’ll be working on my embroidery skills regarding technique, use of color and pattern. Also, I’ve written my first tutorial some time ago, and I want to focus on that as well. I need to get my hands on a nice software for clear graphics and good layout. Inspirational Beading: Who do you hope to inspire with your work? Anika: Basically everyone admiring aesthetic and artful things as much as I do! 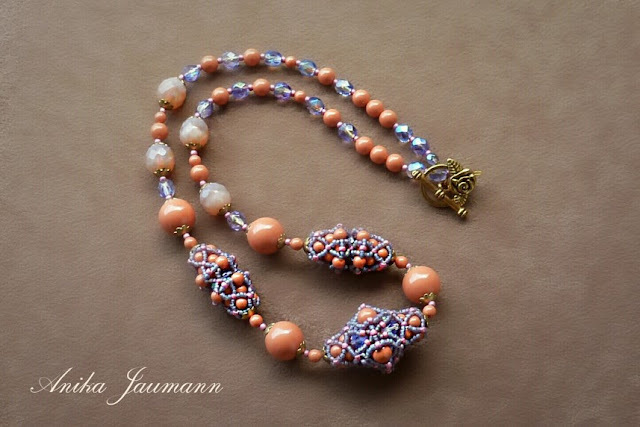 May it be beginner, advanced or professional beaders, artists of other fields, jewelry lovers – everybody with a sense for the beauty we as humans are able to create is welcome. I’ll give my best to inspire people to get their own projects done, be bold to try something new, discover the endless possibilities of color and design, and not be afraid to make a statement with the jewelry they’re wearing. And, most of all, showing your femininity isn’t a weak thing to do – as femininity is so often the center of optical attention, don’t be afraid to be observed and criticized for being too “girlish“, but rather scream it in the face of your opposite “Yes, I am a woman“ by wearing the most interesting, unique and striking jewelry. 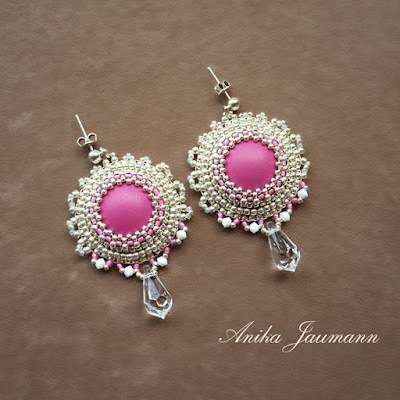 You can see more of Anika’s fabulous beadwork on Instagram and Facebook. Check out the Inspirational Beading About Page for more on what goes on here on the blog. Share book reviews and ratings with Mortira, and even join a book club on Goodreads.